The best part of our day (for my money, anyhow) was a visit to Llano’s local Alco store, which, even though I live in a reasonably metropolitan city and thus have easy access to a multitude of stores and shopping experiences, is always such a supreme treat. If you’ve ever patronized an Alco, then you know exactly where I’m coming from on this, but if you’re a newbie: it’s essentially a Wal-Mart in miniature, selling everything from sheet sets to school supplies to clothing to luggage to household tools to Blu-Ray players to the latest Pistol Annies CD, with perhaps a greater concentration of kitschy home decor items that you’d be hard-pressed to find anywhere else on Earth. A quick visit to Alco’s website informs me that they operate over two hundred stores, mainly in smaller cities (populations between five and ten thousand) strewn across the nation’s heartland clear from Idaho to Florida, and if you ever find yourself in the vicinity of one, you should pop your head in and take a look around. Even if you end up purchasing nothing, you’re sure to find the store’s offerings fascinating, and you never know what you might find. To wit: while ambling through the housewares section in the back corner of the Llano store, I ran across what is quite literally the gayest pillow I’ve ever seen. 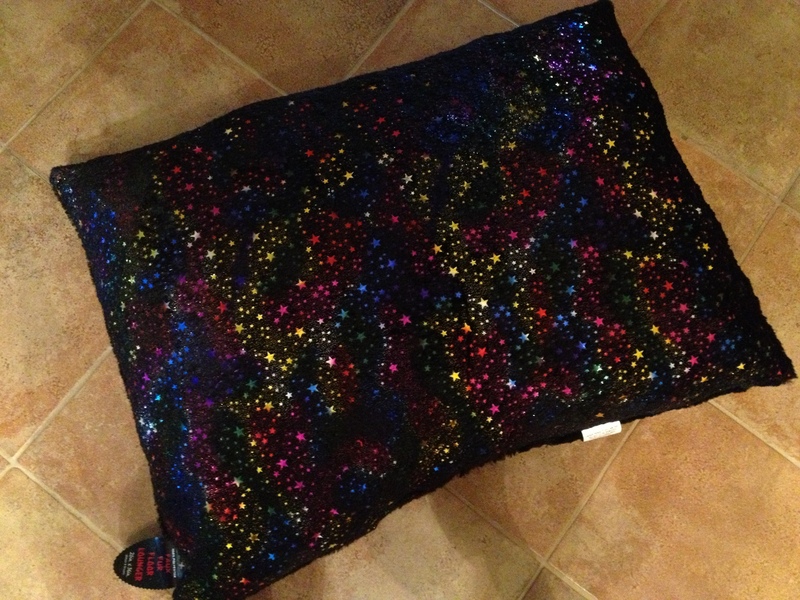 Oversized and made of a soft and fuzzy velvet-like polyester blend (or so the tag tells me), this pillow is adorned — liberally — with rainbow-colored glitter and star shapes. A was instantly mortified by the pillow’s ostentatiously loud fabulousness, but I was immediately entranced, and though he tried in vain to convince me I didn’t really need it, it quickly found its way into my basket. The poor cashier lady was visibly trembling as I laid it upon the counter for her to ring up; it was as though: a) she really had never seen a gay person in her lifetime (see: my postulate in the first paragraph above), and b) she couldn’t quite wrap her mind around the idea that someone would actually have the balls to walk into her store and purchase this pillow. The post speaks perfectly for itself, so let me just say thanks to the corporate buyer(s) at Alco who decided to add this gay pillow to Alco’s inventory and send it to Alco in, of all places, Llano, TX –- you really made our day. (You also made me scratch my head more than a few times as I thought about how these decisions fit into Alco’s corporate profit maximization strategy.) Incidentally, a couple weeks earlier, I went to see the musical Priscilla Queen of the Desert, and the pillow would have fit in perfectly either on the set or in the gift shop!